work has also been exhibited in Europe and abroad, including the Jean Lurcat Museum in France, the Kyoto Art Center in Japan and the National Gallery in San Jose, Costa Rica. 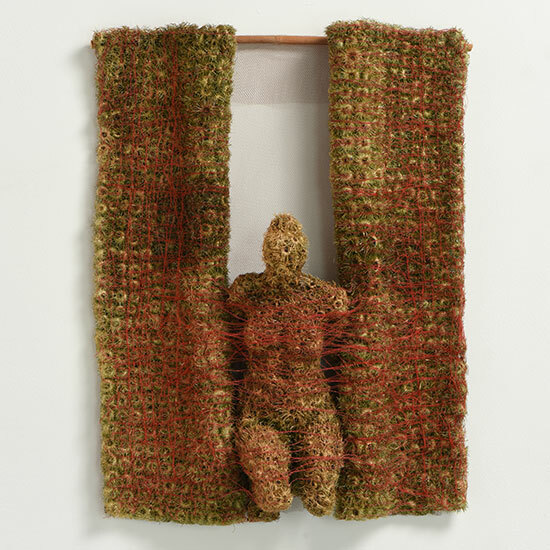 He was awarded a Bronze Medal at the 6th International Fiber Art Biennial, From Lausanne to Beijing and the Grand Prix,12th International Triennial of Tapestry. Cygan is reknown for his textile innovations. 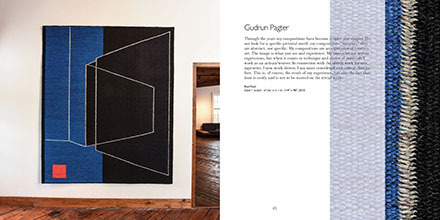 “When trying to determine why the means of artistic expression in tapestry was becoming archaic,” he has written, “I realised that one of the reasons might have to do with the custom of treating the threads of the weft as the chief medium of the visual message. . . . 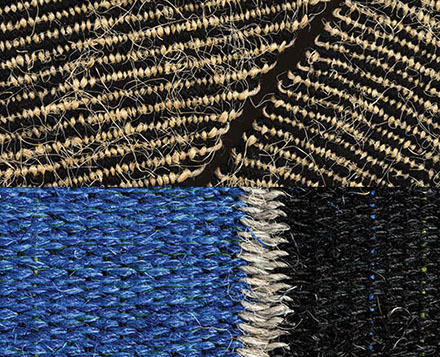 These observations led me to wonder how the artistic language of textiles might benefit from a warp whose strands would not be parallel and flat but convergent, curved or three dimensional. . . .” The result, in some of Cygan’s works, the warp changes direction, the strands enable the weaving of circles or arcs. For more than 10 years, Cygan has been teaching at Gdańsk Academy and Architecture of Textiles’ Institute at Łódź Technical University. Miracle, the work that the artist selected for Artboom, Miracle, which won the Bronze medal at the 6th From Lausanne to Beijing, features a hypnotic curve, that draws the viewer into the heart of the work. 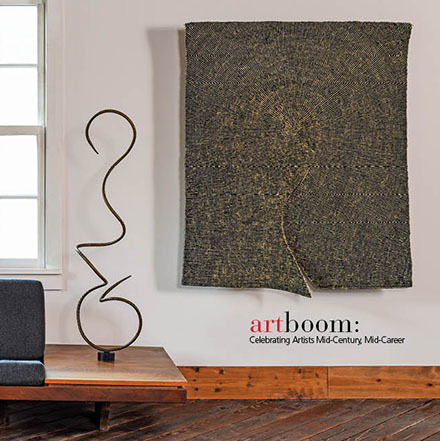 Artboom is open at browngrotta arts, 276 Ridgefield Road, Wilton, Connecticut, for 10 days only. April 30th from 12-6 p.m.; May 1st to May 8th from 10 a.m. to 5 p.m.. For more information, call: 203-834-0623. The 88-page, full color catalog, can be ordered at: http://www.browngrotta.com/Pages/c41.php. Grethe Sørensen’s work is the subject of a dramatic installation at the Round Tower in Copenhagen, Denmark. Traces of Light, couples digital jacquard by Sørensen and video by Bo Hovgaard, film & video producer. 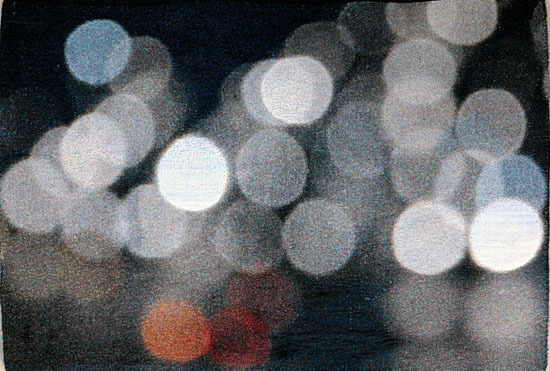 Video recordings of light in the city at night served as the starting point for the project. The unfocused camera acts as a filter that transforms the realism of billboards, street lamps and brightly colored surfaces into varying color effects. The recordings reflect four themes: Rush Hour, City Light, Passing by and Times Square in a Rush. The exhibition includes 18 large weavings alongside the video in large format. The flowing movements of the video create an ethereal counterpoint to the weight and structure of the weavings. Rundetaarn Købmagergade 52A, 1150 Copenhagen K, 33 73 03 73; post@rundetaarn.dk; http://rundetaarn.dk/engelsk/udstillinger.html#Traces_of_Light_; through March 11, 2012. 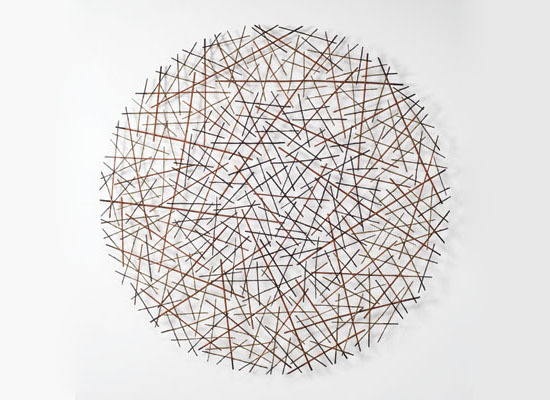 A Sense of Place, at the Philadelphia Art Alliance, 251South Street, http://www.philartalliance.org/exhibitsnew.htm, includes work by Marian Bijlenga and seven other artists. It closes on April 21st. suche.html?keywords=bijlenga&x=0&y=0, which opens March 11th and runs through August 4, 2012. Chris Drury’s work will be a part of Landscapes of Exploration, at the Peninsula Arts Gallery, Plymouth University, UK, from February 11th to March 31, 2012. 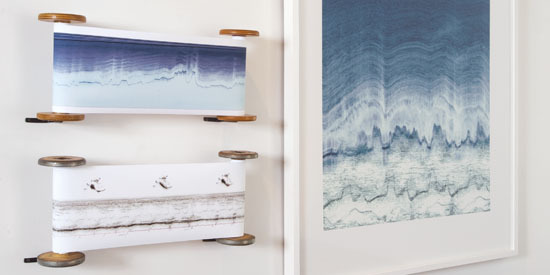 Ten visual artists, one musician and three writers undertook residencies in the Antarctic between 2001 and 2009, under the auspices of the British Antarctic Survey, supported by Arts Council England. This exhibition will bring together for the first time art resulting from the various artistic investigations, offering an opportunity to examine the role of contemporary art in examining Antarctica. Plymouth University, Roland Levinsky Building, Drake Circus, Plymouth, PL4 8AA; http://www.plymouth.ac.uk/pages/view.asp?page=28345#landscapes. The Plymouth City Museum and Art Gallery in Drake Circus will feature a companion exhibit, From Plymouth to Pole: Scott, Science and the Men who Sailed South through April 14, 2012. September offers an abundance of exhibition openings of interest. 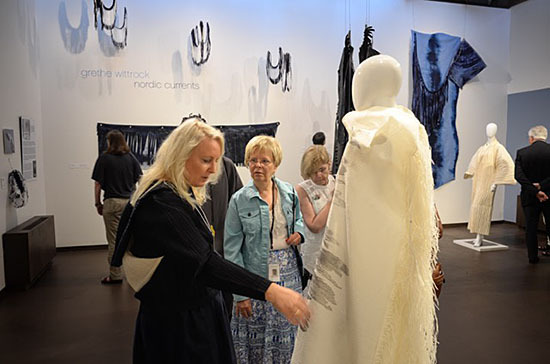 On Sunday the 11th, Connecting opened at the Ostrobothnian Museum in Finland (Museokatu 3 – 4, 65100, Vaasa, Finland; +358 (0)6 325 3800; http://museo.vaasa.fi/w/?lang=3&page=9. 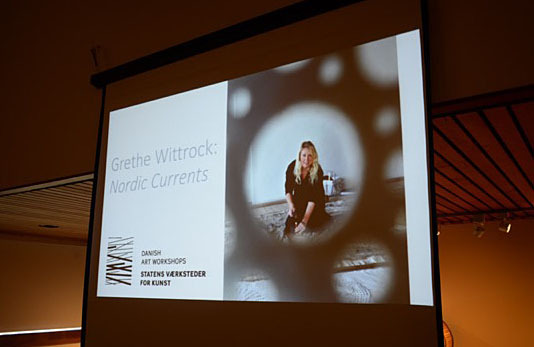 Ending on November 27th, the exhibition features 40 artists from Norway, Denmark, Finland, Sweden and Germany, including Grethe Sørensen. On Friday the 16th, it’s Fiber Futures: Japan’s Textile Pioneers at the Japan Society in New York (333 East 47th Street, (212) 832-1155; http://www.japansociety.org/gallery, through ). Six artists represented by browngrotta arts — Kiyomi Iwata, Naomi Kobayashi, Kyoko Kumai, Hisako Sekijima, Naoko Serino and Hideho Tanaka — are included. (We’ll have more on the opening and the exhibition next week). On Wednesday September 21st the Cheongju Biennale opens in Korea (through November 30th; http://eng.okcj.org/home/contents/view.do?menuKey=277&contentsKey=137) which includes Randy Walker, Chang Yeonsoon and Lizzie Farey. 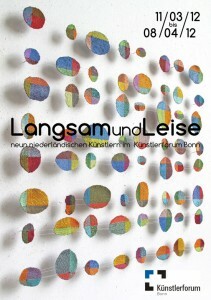 On Saturday the 24th, Energhia — 2011 Miniartextiel Como opens in Italy. 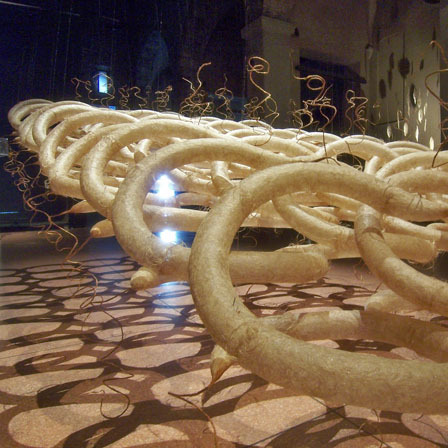 Installed through November 20th, the exhibition features dozens of international artists, including Anda Klancic and Gyöngy Laky (former Church of San Francesco and other locations, Como, Italy; 011-39-31-30-56-21; http://www.miniartextil.it. The ambitious International Kaunas Biennial, Textile 11: Rewind-Play-Forward takes place from September 22nd to December 4, 2011, in Kaunas, Lithuania The Biennial offers a rich programof diverse events – collective and individual exhibits, performances, workshops and a series of conferences organised by the European Textile Network (ETN) – aimed at examining the conceptual evolution of visual and textile arts. On the 23rd, in “Rewind into the Future” several speakers, including Lia Cook, Cynthia Schirra, Reiko Sudo and Chunghie Lee, will discuss how to empower textile culture for the future, why it is important and what is to be done for the upcoming generation. Lia Cook will also show work from her latest research project in cooperation with the University of Pittsburgh School of Medicine including jacquard weavings and a video, in a satellite exhibition About Face. http://www.bienale.lt/2011/?p=375&lang=en Elsewhere, the Fondation Toms Pauli, which played an important role in the International Tapestry Biennials of Lausanne (1962-1995), will exhibit the works of some of the artists represented in its collection of twentieth-century textile art, such as Magdalena Abakanowicz, Jagoda Buić, Kati Gulyas, Ritzi and Peter Jacobi, Jean Lurçat, Maria Laszkiewicz, Wojciech Sadley and Mariyo Yagi http://www.bienale.lt/2011/?p=391&lang=en. For more information, visit the Biennial’s website http://www.bienale.lt/2011/?page_id=2&lang=en or ETN’s http://etn-net.org. 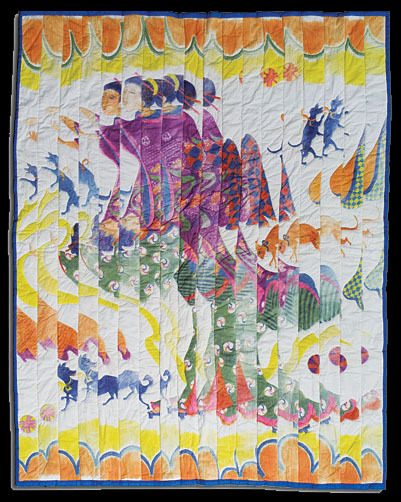 On Sunday the 25th, Golden State of Craft: California 1960 -1985 opens at the Craft and Folk Art Museum, 5814 Wilshire Boulevard (at Curson), Los Angeles; 323.937.4230; www.cafam.org. The exhibition, which runs through January 8, 2012, surveys an extraordinary, innovative artistic period that blossomed in post-World War II California. Working in a range of materials and forms—from furniture, ceramics, and metals to textiles, jewelry, and glass—artists such as Sam Maloof, Katherine Westphal, Ed Rossbach, Lia Cook, Arline Fisch and Marvin Lipofsky defined the ethos of the era and the West Coast way of life through their creations. 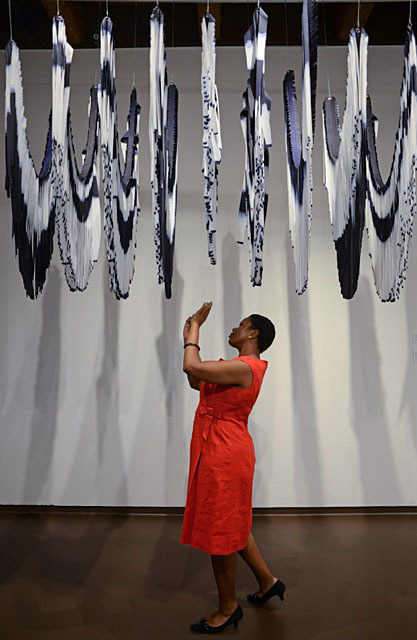 The message that these artists presented resounded across the country, shaping how people perceived their homes and instilled art into their daily lives; it made people see the fabric of their environments in a remarkably new light. The exhibition is part of Pacific Standard Time, http://www.pacificstandardtime.org, a series of exhibitions, involving 60 cultural institutions, mounted in conjunction with the Getty, which celebrates the birth of the L.A. art scene. Ane Henriksen’s work is the subject of a one-person exhibition at the Danish Museum of Art & Design in Copenhagen through August 07, 2011. Henriksen “possesses a very rare degree of insight into how to utilize and master her medium.” observes Bodil Busk Laursen, Director of the Museum in the exhibition catalog of the same name, Lady Sings the Blues: Ane Henriksen. 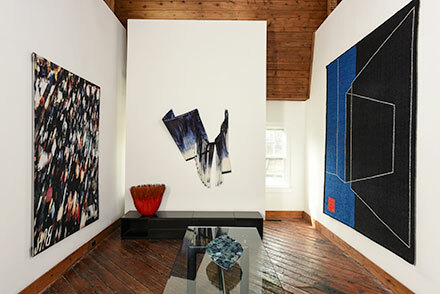 “In her pieces, there is an internal coherence, where the choice of materials, technique, and structure constitutes a most significant aspect of the work’s ultimate expression.” Henriksen has been creating pictorial wall tapestries for 25 years. In doing so, the artist “…with sensitive seismographic precision, has caught hold of painful nodes in the world, in nature and in human existence. Through these pieces, she has managed to redeem experiences that nobody evades,” Laursen observes.